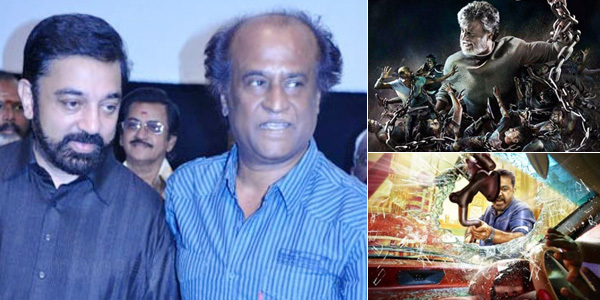 Raaga.com: Clash of Superstar Rajinikanth and Kamal Haasan on the eve of Ganesh Utsav! Who won the war? Clash of Superstar Rajinikanth and Kamal Haasan on the eve of Ganesh Utsav! Who won the war? It was a clash of titans on the eve of Ganesh Utsav when South Indian Cinema’s two greatest Superstars Kamal Haasan and Rajinikanth came on loggerheads for prompting their respective movies to bank the festival’s popularity. No sooner the trailer of THOONGAAVANAM and first look of KABALI were released, the social media was literally ignited with fanatical fans of both the superstars going berserk. So the multi dollar question is - who won this virtual war between the two superstars? According to reports once again the Iconic Superstar Rajinikanth has overpowered the dynamic Superstar Kamal Haasan. As per dominance of their movies on social network it is reported that Kamal Haasan’s THOONGAAVANAM ruled for three hours while in comparison Rajinikanth’s KABALI first look dominated Twitter for an exhaustive seven hours!!! Thus clearly establishing Rajinikanth’s supremacy over Kamal Haasan! However though Rajinikanth’s KABALI may have outscored Kamal Haasan’s THOONGAAVANAM among the film buffs but the fact remains that both Kamal Haasan and Rajinikanth are actors par excellence and have an equal authority over the medium. If on one hand Kamal Haasan has done artistically brilliant films like NAYAGAN, HEY RAM, ANBE SIVAM and ALAVANTHAN that exposed his potentiality as an exceptional actor. On the other hand Rajinikaanth too has proved his competence as an actor to reckon in parallel cinema with movies like MULLUM MALARUM, SRI RAGHAVENDRA and NETRIKANN! Thus in nutshell, the war is won by neither Rajinikaanth or by Kamal Haasan. It is just the sensation of the media that creates a pseudo conflict to generate marketing gimmick for the promotion of the movies!!! Interestingly once Kamal Haasan has rightly said, "Rajini and I used to release our films almost every Friday in the 1980s, but not anymore. Today, we have slowed down, not because of our age, but because of budget constraints. We can't afford to have the release of our big budget films on the same day."